Career Pivot - Repurpose your career. Pivot now. A career design firm for Baby Boomers like you who want a change, but know you can’t just leap from one life to another. For over four decades, Patti Temple Rocks has held senior leadership positions in three distinct communication sectors: PR, advertising, and corporate/client side. She is an inspirational leader, innovative thinker, problem-solver, growth driver, brand steward, and an agent of change. Patti is passionate about fighting age discrimination and helping people understand how it harms individuals, businesses, and society, as a whole. You can learn more about this issue at Imnotdone.rocks. Listen in for ways you can have this conversation where you work and where you live. [1:09] Marc welcomes you to Episode 124 of the Repurpose Your Career podcast. Career Pivot brings you this podcast. CareerPivot.com is one of the very few websites dedicated to those of us in the second half of life and our careers. Take a moment to check out the blog and the other resources delivered to you, free of charge. [1:41] If you are enjoying this podcast, please share it with other like-minded souls. Subscribe on CareerPivot.com, iTunes, or any of the other apps that supply podcasts. Share it on social media or just tell your neighbors, and colleagues. [2:02] Next week will be Episode 125. Marc has categorized the episodes. Look for them on CareerPivot.com/podcast. Scroll past the player to find Show Notes by Category, including interviews, audiobook chapters, series, and more. [3:38] Next week, Marc will interview Paul Tasner. Marc found Paul through his TED Talk where he told his story of being laid off at the age of 64 and becoming an entrepreneur and formed Pulpworks. [4:01] This week, Marc interviews Patti Temple Rocks, the author of a great book on Ageism. [5:46] Marc welcomes Patti to the Repurpose Your Career podcast. Patti reveals some of her personal passions: traveling and experiencing local cultures. [6:28] Patti explains the inspiration to write her book. Her boss and mentor, the first women to reach the C-suite at this large corporation, was pushed to the sideline. Patti asked the CEO why, and he said she was “just tired.” Patti knew that wasn’t true, and she started noticing age discrimination from that point on. [8:45] Patti’s wanted to make sure that didn’t happen to her, and to prepare for the day when the workplace decided it was time for her to go do something else. [9:10] Patti found a lot of writings about creating a second career when you are not perceived as valuable in your first career. Patti wasn’t ready to go do something else. She still had a lot to offer and give. Patti realized there were others who felt the same. [9:55] Patti’s book focuses on a message for businesses: You’ve got to change because there is this huge population of us who are reaching the stereotypical retirement age and we’re not going to want to go. [10:37] Marc has noticed code words for ageism. One term used in his workplace was he “doesn’t have the energy.” Patti says “digital native” can exclude Boomers. [11:07] Chris Farrell in Unretirement: How Baby Boomers are Changing the Way We Think About Work, Community, and the Good Life, says that companies are going to need Boomers. Without companies changing their behaviors, there will still be ageism. [11:29] When Marc interviewed Ashton Applewhite she had said that Boomers need to change behaviors. Patti saw there was room for her book. [11:51] In Patti’s opinion, there were a lot of people willing to make assumptions without having conversations about what is in the best interest of the company and the employee. Talking about age is considered taboo. Talking about salary is forbidden. More transparency in business will uncover inequities. [13:16] People assume that when an employee reaches a certain age, they don’t want to travel or move, or they are not worth training. These untruths continue due to lack of conversation. [13:40] Ageism exists because we don’t talk about it. Patti remembers a time when there were no diversity and inclusion officers or strategies. Today, we are talking about racism and sexism in corporations and in society. Age does not have that protection. [15:31] We need to start noticing when workers in their 50s and 60s are being ushered out of organizations. Ask the question, “What’s going on in my organization?” We can make a change. Marc tells of a case of disguised ageism from his corporate history. [16:30] Patti gives an example of ageism from her own career. Our view of retirement changes as we approach the expected retirement age. [19:34] Marc will interview Andrew Scott in May. Andrew and his wife, Lynda Gratton, wrote The 100-Year Life: Living and Working in an Age of Longevity. Young adults are probably not going to retire until they’re 85. They just haven’t figured that out, yet. [20:29] Marc talks about Del Webb, who opened the first Sun City on January 1, 1960, with five model homes and a strip mall. 10,000 cars came through the first day. A lot of the people smoked. They were in their 60s and weren’t going to live for more than 10 years. Today a married couple of age 65 have a good chance that one will live to 100. [21:53] Patti talks about how Herman Miller has addressed ageism. They realized that if everybody who was eligible for retirement took it at the time of their eligibility, they would have serious labor shortage and knowledge-transfer problems. [22:47] Herman Miller also noticed that most people were retiring without giving much notice. Those people were also not really prepared for retirement. Herman Miller created a program of flex retirement that encouraged employees to work with their managers to plan for retirement in steps, as much as five years ahead of time. [24:13] There almost always was a solution that was in the best interests both of the company and the employee. A major benefit for Herman Miller was in being able to plan for orderly successions with the person whose job is being filled making some contributions to the discussions. This program was a win-win. [25:08] Companies need to realize that it’s in their best interests, from a labor standpoint, to keep their employees around longer. If we Boomers can get people talking about ageism, and treating it as a taboo subject, solutions will arise from that conversation. [26:13] Patti interviewed many people who had experienced ageism. One obvious conclusion is that older workers are not around because of their higher salaries. It’s up to all of us to continue to prove our value, no matter what our age, so that we earn our salary. In cost-cutting times, that may mean reduced hours or a lower-paying job. [27:51] 100% of the people Patti interviewed said that if their boss had offered the option to change roles and reduce compensation, they would surely have considered it and more than likely would have taken it. Most people aren’t in a position to completely retire in their 50s or early 60s, if for no other reason than the high cost of health insurance. [28:30] Nobody should take a pay cut for doing the exact same job but companies can find a way to reorganize someone’s job to use their strengths at a lower salary. [28:51] Marc is living in Mexico because of the high cost of health insurance in the U.S. Marc also notes that he never was offered at any job the option to do something different for less money. [29:20] One of the common themes in Marc’s online community is that everybody wants the freedom of when they want to work, what they want to work on, and how hard they want to work. It’s not as much about the pay. [29:43] Patti has seen through her career that everybody wants flexibility and freedom. It is especially important toward the end of a career. CVS offered a package to pharmacists and store managers to spend winters in Florida. This solved a training and staffing problem and worked out well for older workers. Flexibility is huge. [32:11] Patti’s hope is that, as a result of this conversation in society, we will all have more choices about our own end of careers. [33:46] Patti has the idea that the vast majority of people who don’t get employee reviews when they’re supposed to are over 40. It’s sort of decided for us at that age that we care less about career development. Patti says, let’s take control of the end of our careers, not just the beginning of our careers. [34:28] Marc doesn’t ever want to retire. He wants to work less at something he loves, on his terms. [34:46] Patti’s book, I’m Not Done: It’s Time to Talk About Ageism in the Workplace, is available on Amazon. Patti’s website is Imnotdone.rocks and you can reach out to her there. Patti’s focus in her writings is to continue to raise awareness for this topic. People always thank her for bringing this up. Patti is not done talking about it! [35:41] Marc thanks Patti and hopes you enjoyed this episode. Ageism is not going away anytime soon. Marc recommends Patti’s book. Let him know what you think of it. [36:00] The Career Pivot Community website has become a valuable resource for 50 members who are participating in the Beta phase of this project. Marc is currently recruiting new members for the next cohort. [36:11] If you are interested in the endeavor and would like to be put on the waiting list, please go to CareerPivot.com/Community. When you sign up you’ll receive information about the community as it evolves. [36:27] Those who are in these initial cohorts set the direction of this endeavor. This is a paid membership community with group coaching and special content. More importantly, it’s a community where you can seek help. Go to CareerPivot.com/Community to learn more. [36:52] Marc invites you to connect with him on LinkedIn.com/in/mrmiller. Just include in the connection request that you heard Marc on this podcast. You can look for Career Pivot on Facebook, LinkedIn, or @CareerPivot on Twitter. [37:14] Please come back next week, when Marc will interview Paul Tasner, owner of Pulpworks. [37:20] Marc thanks you for listening to the Repurpose Your Career podcast. [37:25] You will find the show notes for this episode at CareerPivot.com/episode-124. [37:32] Please hop over to CareerPivot.com and subscribe to get updates on this podcast and all the other happenings at Career Pivot. You can also subscribe to the podcast on iTunes, Stitcher, the Google Podcasts app, Podbean, the Overcast app, or the Spotify app. Like what you just read? Share it with your friends using the buttons above. The post Patti Temple Rocks Addresses Workplace Ageism [Podcast] appeared first on Career Pivot. You may wonder which books I recommend to my clients or what I have been reading. It may surprise you that none of the books I am going to recommend from my list are conventional career books. Note this post was originally published in October of 2015. It was updated in April of 2019. While endings are a natural part of business and life, we often experience them with a sense of hesitation, sadness, resignation, or regret. But consultant, psychologist, and best-selling author Dr. Henry Cloud sees endings differently. He argues that our personal and professional lives can only improve to the degree that we can see endings as a necessary and strategic step to something better. If we cannot see endings in a positive light and execute them well, he asserts, the “better” will never come, either in business growth or our personal lives. In this insightful and deeply empathetic book, Dr. Cloud demonstrates that, when executed well, “necessary endings” allow us to proactively correct the bad and the broken in our lives in order to make room for the professional and personal growth we seek. However, when endings are avoided or handled poorly – as is too often the case – good opportunities may be lost, and misery repeated. This book has been life-changing for myself. It is one of the reasons that my wife and I now reside in Ajijic, Mexico. It got me to question why we were still living in Austin, Texas, a city that had changed extensively since I moved there in 1978. This has been a life-changing book for several of my clients. It has given them permission to be themselves within a corporate environment. It also gave a name to something I have been recommending to my clients for some time—a restorative niche. I am writing this post as part of a restorative niche. In his popular Stanford University lectures, Shirzad Chamine reveals how to achieve one’s true potential for both professional success and personal fulfillment. His groundbreaking research exposes ten well-disguised mental Saboteurs. Nearly 95 percent of the executives in his Stanford lectures conclude that these Saboteurs cause “significant harm” to achieving their full potential. With Positive Intelligence, you can learn the secret to defeating these internal foes. This book is about identifying and naming your saboteurs. Once you have done that, you will be more aware of when they pop up in your thinking. Even if you do not read the book, I recommend you take Shirzad Chamine’s Saboteur Assessment. Many in the Career Pivot online community have either gone through the author’s program or are working through the book. One of the most important concepts I extracted from this book was weak ties. Weak ties are those people you do not know well…those people with whom you only have a casual relationship. Those relationships are invaluable in managing your career because they run in different social and professional circles. WOW…this concept proved invaluable to a 59-year-old client this year who harvested lead after lead from his weak ties. By forcing us to apply a more selective criteria for what is Essential, the disciplined pursuit of less empowers us to reclaim control of our own choices about where to spend our precious time and energy – instead of giving others the implicit permission to choose for us. Essentialism is not one more thing – it’s a whole new way of doing everything. It’s about doing less, but better, in every area of our lives. Essentialism is a movement whose time has come. A good example of how this book can be used is in the post Learning to Say “No” and Not Feeling Guilty. Many of the concepts from this book can be applied in your everyday life. With all of these books, I have either listened to them via Audible.com or read them on my Amazon Kindle device. In the last year, I have become a huge fan of Audible.com. You can blame my son for that! You will find these books and others that I recommend on my resources page on this website. Do you have recommendations for me? The post Top 5 Career Books that have Nothing to do with Careers [Updated] appeared first on Career Pivot. Creative destruction occurs when a disruptive industry supplants a legacy industry, causing the loss of some jobs and the creation of others. Marc explains the need to get ahead of the disruptions in your industry, using examples from industrial giants who quickly became insignificant or who vanished as a result of unexpected market or social movements. Marc shares current technological changes and views of more drastic changes soon to come. Listen in for a sample of the helpful advice in the new edition of Repurpose Your Career. [1:14] Marc welcomes you to Episode 123 of the Repurpose Your Career podcast. Career Pivot brings you this podcast. CareerPivot.com is one of the very few websites dedicated to those of us in the second half of life and our careers. Take a moment to check out the blog and the other resources delivered to you, free of charge. [1:44] If you are enjoying this podcast, please share it with other like-minded souls. Subscribe on CareerPivot.com, iTunes, or any of the other apps that supply podcasts. Share it on social media or just tell your neighbors, and colleagues. The more people they reach, the more people they can help. [2:06] Next week, Marc will be interviewing Patti Temple Rocks, author of I’m Not Done: It’s Time to Talk About Ageism in the Workplace, a great book on ageism. Marc thinks you will like this great interview. [2:20] If you are a regular listener to this show, you probably noticed that Marc has stopped talking about the next edition of his book, Repurpose Your Career. Susan Lahey and Marc are back on track and a draft of the third edition just got sent to the copy editor. [2:35] Marc’s plan is to release the third edition of the book in September of this year. [2:41] This week, Marc will read the pre-release chapter, “Learn to Embrace Creative Destruction.” He plans to release this chapter in PDF form to the review team within a week. [2:54] If you are interested in being on the release team and get early access to chapters in the new edition, go to careerpivot.com/rycteam. Marc hopes you enjoy this episode. [3:12] The pre-release chapter of “Learn to Embrace Creative Destruction.” In his book, Antifragile: Things That Gain From Disorder, writer Nassim Nicholas Taleb explains the problem of turkeys. A butcher feeds a turkey for 1,000 days. Every day that that turkey’s life remains constant confirms the surety of his current existence. [3:40] “This is the way it goes. This is the way it has always gone. This is the way it always will go.” All of the data confirms that butchers love turkeys. The turkey can rest confident in this idea because he has 999 days of benevolent treatment to back it up. [4:01] Then, a few days before Thanksgiving, everything in his worldview is upturned. This is what Taleb calls a ‘black swan event.’ All of the evidence proves it can’t happen, until it does. [4:16] The truth is that this is the normal course of things in human existence. A sudden rain shower hits the picnic. A car accident ruins travel plans. A financial windfall or unexpected romance changes your trajectory. Death comes unexpectedly. This is how life is. [4:36] In the world of work, the force behind these changes is often the power of creative destruction. One thing is destroyed and another is created. The turkey’s life is over. Dinner is served. [4:52] If the change is in our favor, we think it’s a good change. If the change is not in our favor, we think it’s a bad change. Regardless of how we feel about it, though, it’s going to happen. We need not be taken by surprise, like the turkey. [5:10] I was listening to a rebroadcast of a Freakonomics Radio podcast called “How Safe Is Your Job?” The hosts were talking about pianos. In 1905, they said, 400,000 pianos were made in America. If you wanted music in your house, you learned to play the piano. [5:49] Today only about 30,000 pianos are made each year, about eight percent of the number made in 1905. [5:58] Each new iteration of musical enjoyment was a form of creative destruction. Each caused people in the previous industry to lose jobs or pivot. [6:09] In 1975, an employee of the Kodak company created a digital camera. But instead of developing it, Kodak concluded it was a non-starter because they didn’t think people wanted to look at their pictures on their TVs. So the company continued on focusing on chemical film until it became clear that they had bet on the wrong horse. [6:31] In 2001, Kodak had the second-most-popular digital camera on the market but lost $60 on every sale. A decade later, Kodak declared bankruptcy. [6:47] In these cases, creative destruction took 20, 30, or 40 years to bring down one giant and birth another. Now, that pace is accelerating. [6:58] Amazon.com was founded in 1994 and, initially, just sold books. They were credited with the demise of several brick-and-mortar bookselling chains. Over the next 11 years, Amazon moved into retailing pretty much everything and by 2015, it passed Walmart to be the most valuable retailer in the world, by market capitalization. [7:24] It took them and their online retail competitors only a few years to bring down what had been a staple of the world economy, the brick-and-mortar store. [7:36] In 2018, Amazon started buying surviving brick-and-mortar retailers, including Whole Foods, presumably to collect data on people who still shop there and further strengthen their market presence. [7:50] Now, Amazon is opening brick-and-mortar stores around the country, including convenience and book stores. They’re remaking retail, Amazon-style. [8:00] The iPhone was created only 11 years ago, in 2007, but at that time, I used my phone for talking to people. [8:10] Today, this is what I use my phone for: the weather report from the Weather Channel app; manage my social media with LinkedIn and Twitter. I removed the Facebook app after the last presidential elections. [9:04] … search Google to answer the question my wife just asked me, and watch House Hunters International on HGTV via the Sling TV app. Oh, and a lot of people use them to listen to music. [9:38] S = Social media: LinkedIn Facebook, Twitter, Pinterest, Instagram, and Snapchat. Today, people go to social media for everything. It’s the U.S. Mail, the telephone, the photo album, the gossip chain, the opinion column, the news, the entertainment, education, and job board, all rolled in one. [10:02] It’s also one place employers go to find you and find out whether you are the kind of candidate they want. [10:10] M = Mobile. Roughly 60% of adults get their news on a mobile device. According to the research by the Pew Research Foundation, mobile apps track our behavior and our preferences as well as give us a means to pay for things. People use mobile devices to shop, to bank, and to date. [10:32] If your career isn’t mobile-friendly, you will be left in the dust. [10:39] A = Analytics. More data has been collected in the last few years than was collected in the previous century. A lot of it is coming voluntarily from our activities via social media and mobile. [10:55] How we shop, where we shop, what we pay with, where we go online, and even how long it takes to get somewhere are some of the things that inform this data. Do you remember the movie, Minority Report, where Tom Cruise walks through the mall and hyper-customized ads display everywhere? [11:15] Analytics will affect how you are hired. [11:19] C = Cloud. Cloud is changing everything in the technology world. Most of the major technology hardware vendors are seeing portions of their business collapse because data isn’t being stored on their hardware. It’s being stored in the Cloud. [11:39] A classic example is IBM, who missed the shift and is seeing massive changes in their business. Their hardware business is collapsing. Cloud computing is sometimes referred to as SaaS or Software as a Service. [11:55] With SaaS, you don’t have to buy a disc. You don’t have to save data on your computer. You don’t have to have a photo album or a filing cabinet. You can keep everything in the Cloud. [12:10] Also, you can get services in the Cloud, rather than hiring someone to do them, like bookkeeping, record keeping, customer relationship management, and marketing. [12:19] You can book travel on the Cloud, make appointments in the Cloud, even hold conversations in the Cloud. SMAC is a representation of what we’ve long called the Robot Invasion. Articles have said for decades that robots are going to take our jobs. And SMAC is robots doing just that. [12:48] Surprising jobs a robot can do: journalism. [14:52] Automation robots will have an incredible impact on medical professions. If a doctor wants an EKG, he can record it on your smartphone app. All of your medical data will be digitized, including X-ray images, CT Scans, and MRIs. [15:12] The Economist produced a special report called “Automation and Anxiety,” which discussed the impact on medicine of deep learning. A product from Enlitic can outperform doctors in reading diagnostic images. [15:27] It’s not just the images are sent to places like India or China to be evaluated by doctors who are paid less but automation and robots are actually doing the work that doctors have always done. [15:40] Jobs are being eliminated in retail at an alarming rate. Retail giants like Sears have shed legacy brands such as Craftsman and Lands End in an effort to survive. Many specialty chains are failing, like Tailored Brands (TLRD), owner of stores like Men’s Wearhouse and Jos. A. Bank. [16:05] Amazon is opening up stores like Amazon Go, where people can do their whole shopping trip without interacting with a single person. As the “Fight for Fifteen” movement works to raise the minimum wage to $15 an hour, one of the unintended consequences will be the deployment of automation and robots. [16:25] I’m already seeing fast food chains rolling out mobile apps and kiosks where you can order your food and never have to speak to a person. [16:35] I’m seeing lots of requests for career middle managers in the retail segment looking for assistance in getting out of the industry. A 2018 study by PWC predicts that nearly 40% of jobs in the U.S. may be vulnerable to replacement by robots in the next 15 years. [16:54] Hopefully, I’ve demonstrated to you that professions that one would have thought would be immune to automation and robots are at risk. Similarly, if the industry where you are working is at risk, you must be on the lookout. [17:10] If you think you are safe from automation and robots sabotaging your career, you must be smoking something! And yes, you are inhaling. [17:22] It is devastating to realize that the career you built — the skills you’ve honed, the seniority you’ve acquired — have all been wiped out because someone built a robot that can do what you do faster and cheaper if not better. [17:38] For many people, these changes have hit like an earthquake or hurricane. They are living in a career disaster area. They will recover but they’re not moving back into the old house. [17:52] Sally was 65 and was a consummate marketing professional. She had worked in a variety of different industries over the span of her career. At different times in her career, she worked freelance and she worked for some major agencies. [18:06] Like many of her peers, she took a hit in the great recession. Then her spouse passed away suddenly and Sally decided to move across the country to be closer to her children. [18:16] Now, she’s trying to re-establish herself in a new city where the culture and job market are very young and vibrant. Sally is taking courses in social media and digital marketing but the skills required to be productive marketing professional have made tectonic shifts in the direction of technology. [18:37] In the 1990s, when I was working in a marketing and sales support function in IBM marketing or in the executive briefing center, we produced presentations and marketing collateral; web content that supported the sale of IBM hardware and software. That world no longer exists. [18:56] The world that does exist today, as I launch the Career Pivot Online Community, requires a completely new set of skills. I’m learning about Facebook marketing, Google Adwords, re-marketing, re-targeting, pixeling strategies, ad networks, and other digital marketing approaches. [19:14] When I made the decision to leave the world of technology marketing, more than 15 years ago, I left a place that looks nothing like it does today. Can Sally shift into this new technological marketing world that’s populated with a very young workforce, at the age of 65? It’s possible but not probable. [19:37] Larry is also 65. He is an engineer who has worked for some of the top companies that designed and manufactured leading computer hardware through his career. He was a program and project manager for huge multinational, multi-company development projects with huge scope and complexity. That world is disappearing, fast. [19:59] Companies like HP, IBM and others have seen their hardware business almost completely disappear. Companies like Sun and DEC have been wiped off the map in a very short period of time. [20:14] There are many like Larry, who built their careers around designing large and ever-growing complex hardware systems. But in the last 10 years, the hardware market has been commoditized. The iPhone sitting next to me has more computing power and function than huge computers of just a few years ago. [20:35] Larry interviewed for a program management job with one of the leading Cloud infrastructure companies. And the first thing they asked him to do was to take a coding test. What?! A coding test? For a program management job? [20:51] Like Larry, I haven’t written a line of code in over 15 years. Could I pass a coding test? Probably not. Does it make sense that they want to see if he can code? Probably not. But that’s not the world we live in, now. [21:06] They moved my cheese. The complex world that Larry excelled and thrived in moved from hardware to software, at Warp speed. They moved Larry’s cheese — referencing the book Who Moved My Cheese, an amazing way to deal with change in your work and in your life by Dr. Spencer Johnson — and he didn’t even realize it. [21:31] The career space that Larry and his peers lived in for so many years now looks like a career disaster area. Like Sally, he could retool but can he do it fast enough and be accepted in a very young, fast-moving market? It’s possible but not probable. [21:52] It’s now time to shift expectations and direction. People can and do rebuild after a disaster. Sometimes people have to walk away from the disaster scene because it’s just too risky to stay. This is the destruction part. But after a period of grieving all that, it’s time to move away from destruction and get on with creation. [22:15] From here out, there is no safe haven where you can just tuck yourself in and work as long as you want to work. Creative destruction is happening every day and you have to be constantly learning, evolving, and pivoting. How you do that is the subject of the next chapter. [22:35] Action steps: Is your industry in the process of being SMACed? Evaluate where you’re keeping up with changes. Research what skills you need to keep up with your current industry and how much of a challenge will that be? Does it mean going back to school or merely taking online classes? [22:55] Write down how your current skills might be useful in other emerging business types or industries. [23:04] Marc hopes you enjoyed this episode. It is imperative that you learn to embrace creative destruction, as it’s not going away. If anything, it’s going to accelerate. [23:15] The Career Pivot Community website has become a valuable resource for about 50 members who are participating in the Beta phase of this project. Marc is currently recruiting new members for the next cohort. [23:27] If you are interested in the endeavor and would like to be put on the waiting list, please go to CareerPivot.com/Community. When you sign up you’ll receive information about the community as it evolves. [23:43] Those who are in these initial cohorts set the direction of this endeavor. This is a paid membership community with group coaching and special content. More importantly, it’s a community where you can seek help. Go to CareerPivot.com/Community to learn more. [24:07] Marc invites you to connect with him on LinkedIn.com/in/mrmiller. Just include in the connection request that you heard Marc on this podcast. You can look for Career Pivot on Facebook, LinkedIn, or @CareerPivot on Twitter. [24:28] Please come back next week, when Marc will interview Patti Temple Rocks, author of I’m Not Done: It’s Time to Talk About Ageism in the Workplace, a great book on ageism. [24:38] Marc thanks you for listening to the Repurpose Your Career podcast. [24:43] You will find the show notes for this episode at CareerPivot.com/episode-123. [24:57] Please hop over to CareerPivot.com and subscribe to get updates on this podcast and all the other happenings at Career Pivot. You can also subscribe to the podcast on iTunes, Stitcher, the Google Podcasts app, Podbean, the Overcast app, or the Spotify app. I define a survival job as any position that you plan on taking temporarily. This might be taking a retail position at Home Depot, or substitute teaching with the local school district, or even working for a family member in an administrative role. Note: This post was originally published in 2014 and was updated in April of 2019. Launch Pad Job Club now has a signature program called Leap to Success where club members work on real projects for area nonprofits pro-bono. The projects are intended to last only 4-6 weeks and only require a 10 hour per week commitment. Take a seasonal position at a company where you want to work. Whole Foods Market, which is headquartered in Austin, gives priority to candidates who have worked there. For example, if you want an IT position, you can work as a cashier during the holiday season, impress the manager, and you will likely be given priority in interviewing for IT positions. Seasonal government positions – This could be a census taker or working local elections. You never know who you might meet. Notice that all of these positions are short term, let you engage with people and give you the flexibility to keep up your job search or look for your next career pivot. Will this Position Help Me Acquire a Skill? Volunteer with programs like Austin Leap To Success. LTS is the signature program of Launch Pad Job Club where projects are done for local non-profits. Maybe you can dust off an old skill, polish up a current skill or learn something new. Obviously, if you went to work for an adult-oriented business, you will likely not want to put this on your resume. If you do not, you will need to explain the gap in your resume. This also could include working for religious or political organizations. In today’s politically correct climate, you will want to clearly weigh your options. Tom went to work 4 days a week at Home Depot. He is back interacting with people that energize him. It forces him to get up at the same time each day and he has developed the discipline to wall off time, when he is not working, to focus on his freelance business. Larry took a job as a bank teller. It was at a community bank where operations were still pretty manual. When he went through teller training it forced him to use skills he had not used in years. He only did this for 4 months, but it gave him confidence that he could still learn and stretch himself. Sherry drove for Lyft. She loves to drive and interact with people. Driving for Lyft gave her the opportunity to do both. The kicker is Sherry picked 2 consulting clients from passengers. Was this serendipity? Yes. However, Sherry’s brain and attitude were re-engaged and making her more employable. All of these examples allowed them the flexibility to keep focusing on their next career steps and they only took survival jobs for a few months. What it did was re-engage their minds and bodies that can sometimes only happen when you are working. What are the liabilities of taking the position? Will your mind, body, and spirit improve from going back to work, even for a short period of time? 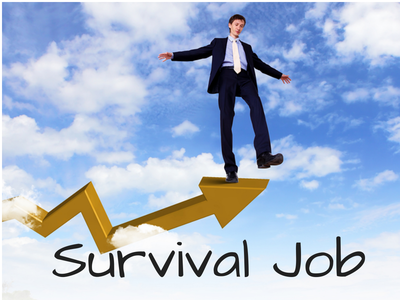 Have you taken a survival job? What were the positives and negatives? The post Should I Take a Survival Job and Why? [Updated] appeared first on Career Pivot. Susan is Marc’s co-author for the Repurpose Your Career books. Susan Lahey is a freelance writer who is driven to taking on new challenges, whether they’re writing about the nature of meaning, the scary adventure of changing your career, or truly death-defying acts like jumping out of airplanes and parenting. Marc was her first real Austin client. Listen in for an update, where Susan discusses her upcoming move to Portugal. [1:09] Marc welcomes you to Episode 122 of the Repurpose Your Career podcast. Career Pivot brings you this podcast. CareerPivot.com is one of the very few websites dedicated to those of us in the second half of life and our careers. Take a moment to check out the blog and the other resources delivered to you, free of charge. [1:40] If you are enjoying this podcast, please share it with other like-minded souls. Subscribe on CareerPivot.com, iTunes, or any of the other apps that supply podcasts. Share it on social media or just tell your neighbors, and colleagues. [1:58] Regular listeners probably have noticed Marc has stopped talking about the next edition of the Repurpose Your Career book. Between last week’s episode about the Miller’s trip back to Austin and starting the resident visa process and this week’s episode, it is evident that the Millers have gotten busy but are getting back on track. [2:23] Marc’s current plan is to release the third edition of the book in September of this year (2019). He will continue to release preview chapters starting in a couple of weeks. [2:35] Next week, Marc will read one of the pre-release chapters of the next edition. Stay tuned! [2:42] This week, Marc will share an Encore Episode of Episode 54, where he interviewed Susan Lahey, who is the co-author on the Repurpose Your Career books. Marc shares Susan’s bio. [3:33] Marc is excited to present this episode. Susan is a freelance writer and a lot of the listeners want to become freelance writers. [3:55] Susan is always tempted to stay home with her adult children and watch Netflix, paint, and hide out from everyone. So she makes herself go do stuff, instead. She just got a tattoo that says “Life is Short” to remind herself to push past whatever fears and barriers she has. [5:12] Susan was a newspaper reporter for the beginning of her career, at the Kansas City Star, from age 17 through college and as her first job out of school. After several years she got a job as an associate editor of a business lifestyle magazine in KC. She left there to raise a family, freelancing from home. [5:57] At age 42, Susan was divorced. She took the children and moved to an off-the-grid house in New Mexico, taking what work she could get. The Taos News wanted her as a freelancer but didn’t move on it. [6:58] She started working as a community liaison for an EPA technical assistance group for a Superfund project. That was tough since she did not speak Spanish and was new to the community. She also did substitute teaching. She was broke. [7:29] Susan and her children volunteered at a food pantry for the food. Finally, she got on as a freelancer with the Taos News, for maybe $100 an article. [8:19] Taos was challenging in being far behind the times. Susan was out of touch with the times as a freelancer. She wanted to give her children a better opportunity. [11:02] At first in Austin, she wrote eHow articles but that was unsatisfying for her. Susan met Marc and attended networking events. She met Jenny Magic. Susan learned how to market herself online with blogs and web content and how to network. Susan used EMDR psychotherapy to help her overcome the fear and stress of networking. [15:38] Creatives are typically introverted so selling themselves as “a creative” is really hard for them. Confidence is essential for approaching clients. [17:31] Marc was Susan’s first major client. Then she got some blogs. Through a contact recommended by Marc, she started writing articles for a tech news startup, Silicon Hills News, and finally got paid reasonably. Susan has covered SXSW for the last six years and she went to Thailand and Norway to see their technologies. [19:41] Susan got an article in Wired and is hoping to write more for them. She had also written a profile for bootstrap guru Bijoy Goswami, who works people through the psychological risks and fears of starting your own business. [20:14] Bijoy introduced Susan to his best friend, Danny Gutknecht, and Susan worked with him on one book and other writings. They will write more. Most of her work is with Danny. When Susan has ‘bandwidth,’ she looks for freelance work online (at GlassDoor and MediaBistro) and she networks. [21:20] Susan mentors and one woman she mentored hooked her up with a gig of writing for Zendesk. She still does journalism. [21:45] Susan was an old-school journalism person. Her idea of journalism came from All the President’s Men. Her sister was a journalist. She never imagined journalism wouldn’t be there for her. Most of her friends who were journalists are out of jobs. Journalism is dying. Journalism can’t find a business model that works today. [22:41] Susan never imagined she would be a tech writer or a business writer, and she is so glad she pursued both of those because that’s the direction the world is going. She never thought she would get to travel the world for tech writing. [23:31] When Susan was asked to find her ‘why’ she had never thought about it. She realized that she loved writing about people who were doing scary, brave things. She uses Marc as an example. When he started his business, it was scary new for him, but also, scary new for the job pivoters he is helping. Her children encouraged her career. [24:46] For the most part, Susan’s career pivot has turned out amazingly. She’s definitely not rich, but she’s supporting herself, doing what she loves. It fuels her as well as paying her. Ninety-nine percent of what Susan writes fits that category. [25:11] Marc is proud of Susan. In spite of her hard times, she has survived. Her three great children have gone to college on full scholarships, and are doing well. Her oldest is teaching English in Tangier, as Susan continues to enjoy her career. [25:54] People tell Susan she’s brave but they have no idea how hard she has to work to be brave. She’s sometimes afraid but she just makes herself do things. She recommends people examine why they act a certain way or go in a certain direction. They need to examine their self-limiting ideas. People need to steer their own ship. [27:24] Susan hopes to move to Morocco in the next year or so. Marc mentions his plans to move to Ajijic, Mexico. Marc thanks Susan for telling her story. [29:04] Marc welcomes Susan back after the interview for an update on her career since this episode was recorded. [29:16] Susan is now planning to move to Portugal. She just got back from there. She was planning to move to Morocco, originally, but her son cautioned her that as long as she doesn’t understand Arabic, she would not be safe in the street culture. [29:45] She started looking at other options, such as Portugal, that have a visa for self-employed people who make a moderate living. The Netherlands has a similar visa. Susan settled on Portugal because the Netherlands is cold and expensive and Portugal is warm and cheap. [30:10] Everyone Susan mentioned it to told her Portugal is so beautiful she wouldn’t believe it. She wanted to apply for the visa before visiting but she needed an actual lease on an apartment and a tax number before that was possible. Rather than hire someone to do that, she went herself, to set things up. That was a really good idea. [30:57] When Susan’s youngest graduated from college she felt free to do what she has always wanted to do — move to Europe. Until she moves, she and her son have moved in with her daughter. They all get along really well. [31:56] Susan’s youngest son will go to Portugal with her on a visit, to check it out. He might also move to Portugal. Susan’s daughter just went with her on her recent trip, and she loves it! [32:28] Because Susan is single the prospect of being an empty-nester was terrifying to her. For the last twenty-something years her purpose had been to raise her three children. Now she has to find out what is important for her. She doesn’t want to fill time taking spin classes or doing Soduko. She has always wanted to travel. [33:27] She decided she needed to find a place where she could live and see the world more inexpensively. It’s hard and expensive to get around the world from the U.S.
[33:54] Susan has talked to several of her clients and told them her plans. Since she works remotely with most people, anyway, no one was concerned. Susan has never met some of her clients in person. While she might work with some Portuguese companies, it is simpler to just keep working with her U.S. clients. [34:37] Susan has “sort of” figured out the technology she needs. She got an apartment, and a SIM card, so she now has a Portuguese phone number. She almost made an illegal and costly mistake with an apartment contract. [35:15] She ended up hiring an advisor or consultant who took her to the local tax office for a tax number, to the bank for a bank account, and recommended a fantastic real estate agent, who hustles. The agent took Susan to several different apartments. [36:38] Susan was considering two apartments. Both the owners backed out because Susan was not from Portugal and didn’t have a co-signer. Her agent found her another apartment but Susan is waiting for the contract. Every contract is drawn up by a lawyer; they don’t have boilerplate contracts for apartments. Each contract is bilingual. [37:37] On Facebook, Susan was looking at a group for the area. Fabiola, Susan’s real estate agent, who will live in the same neighborhood, had put a post on the group talking about what internet provider she would use. Susan believes she will go with the same provider. [37:53] If nothing else, Susan will go to a café for the internet. [38:00] Marc is very proud of Susan for having made this leap. Marc comments that in Mexico, ‘mañana’ does not mean tomorrow; it means not today. [38:14] Susan thanks Marc for all the help getting ready to go. She finds Portugal to be very chill and relaxed. Someone there told her she should move there. Susan felt she could really do this. She loves Portugal. It’s stunningly beautiful, the food is very good, and everything is affordable. People are insanely nice. It’s going to be great! [39:18] Marc thanks Susan for giving us an update on her experiences. Susan appreciates how supportive Marc has been while she has been preparing to go. Marc says he talked Susan off the ledge before she went. [39:42] Marc hopes you enjoyed this episode. Susan has done a lot of research on her move. Marc was afraid she would move to Portugal without ever visiting there. [39:55] In Episode 119, Marc interviewed Queen Michele, who moved to the North Shore of Lake Chapala without having ever visited. Queen did a ton of research and even walked around the town using Google Maps’ Street View feature. [40:13] Marc “talked Susan off the ledge” before she went, and she’s doing quite well. [40:20] The CareerPivot.com/Community website has become a valuable resource for more than 50 members in the Beta phase of this project. They have crossed the 50-member threshold! Marc is recruiting new members for the next cohort in a few weeks. [40:33] If you are interested in the endeavor and would like to be put on the waiting list, please go to CareerPivot.com/Community. When you sign up you’ll receive information about the community as it evolves. [40:48] Those who are in these initial cohorts set the direction of this endeavor. This is a paid membership community with group coaching and special content. More importantly, it’s a community where you can seek help. Go to CareerPivot.com/Community to learn more. [41:12] Marc invites you to connect with him on LinkedIn.com/in/mrmiller. Just include in the connection request that you heard Marc on this podcast. You can look for Career Pivot on Facebook, LinkedIn, or @CareerPivot on Twitter. [41:33] Please come back next week, when Marc will read a chapter from the next edition of Repurpose Your Career. [41:39] Marc thanks you for listening to the Repurpose Your Career podcast. [41:43] You will find the show notes for this episode at CareerPivot.com/episode-122. The post Encore Episode with Freelance Writer and Author Susan Lahey [Podcast] appeared first on Career Pivot. The job market today is incredibly volatile. People are staying with the same company for shorter periods of time (partially due to many companies’ lack of loyalty to their employees). Well educated employees are coming from overseas, companies are outsourcing certain business functions, and many companies employ the tactic of laying off tenured employees in order to cut costs often under the guise of bringing in young blood. The key to keeping your job–and gaining recognition and promotion–is to become so valuable to the company that they wouldn’t consider moving on without you. The most common suggestion found is to stay up to date with technology which is a given. Here are the top 5 tips on how you can remain valuable in a volatile market. Employers value specific personality traits in their employees. They are looking for employees who are confident and capable both during the work day and in public. They also want employees who are positive, no matter the situation. The key to being confident in work has a lot to do with the way that you carry yourself. Focus on your posture and your gestures to ensure that you’re giving off an aura of authority and confidence. Then, even when you’re faced with a frustrating situation, tackle it with a smile. In the workplace, those who show emotional intelligence are more valued than those who don’t notice social cues. Having emotional intelligence in the workplace means that you’re able to communicate and express yourself with ease. The term “emotional intelligence” was coined in the 1990s to describe those who were more capable of interacting with others on a mature level. Businessmen quickly came to recognize the importance of having emotional intelligence and made it one of the most important qualities to look for in job candidates. It’s often said that we are our own worst critics. In the workplace, this is especially true. We often compare our work to others which makes us critique ourselves and become less confident. This usually means that the future products that we produce are lower and lower in quality as we feel less confident. Instead, you should focus on the products that you are producing and ignore everyone else. Rather than thinking you’re in a competition with the other employees, be in competition with yourself. In the end, you will learn to admire the work that you produce and feel more confident about yourself. Change is inevitable. As a business grows, it fluctuates. New positions will be created and scrapped within the same hour. New customers will come and go and the location of the business could be changed. A changing business is part of the market. Employers respect those who are able to change with the business. Rather than acting like a stiff, raw spaghetti noodle, act like one that has been boiled. Move, rotate, and twist with whatever changes your employers throws your way. No matter where you stand in the business, you will be more valuable if you can prove that you’re willing to make others feel important and you’re able to celebrate when others succeed. Employers like to have employees who don’t grow bitter when their colleagues are promoted and instead are able to celebrate. Focus your attention on the people around you and prove that you’re the kind of person who reaches outward rather than inward. To show your employers that you’re a valuable asset to their team, get to work on time and show them through your work ethic that you consider yourself a valuable member of the team. Employers respect confidence and passion and if you can show them that you have both of those traits, you’ll prove that you’re a needed member of the company. Craig has worked in health, real estate, and HR businesses for most of his professional career. He graduated from UC Berkeley with a bachelor’s degree in Marketing. The post How to Remain Valuable in a Volatile Market [Guest Post] appeared first on Career Pivot. In this episode, Marc covers the events of the Millers’ trip back to Austin where they stayed with an old friend, Marc’s presentation to an association of his Multi-generational Workplace Workshop, getting rid of old stuff, connecting with old friends, and stocking up for the trip back to Ajijic. Marc covers the steps to getting resident visas, crossing the border, and meeting with their attorney in Mexico to get their paperwork processed. Listen in to this fascinating episode for insight into becoming an expat with U.S. ties. [1:12] Marc welcomes you to Episode 121 of the Repurpose Your Career podcast. Career Pivot brings you this podcast. CareerPivot.com is one of the very few websites dedicated to those of us in the second half of life and our careers. Take a moment to check out the blog and the other resources delivered to you, free of charge. [1:41] If you are enjoying this podcast, please share it with other like-minded souls. Subscribe on CareerPivot.com, iTunes, or any of the other apps that supply podcasts. Share it on social media or just tell your neighbors, and colleagues. The more people Marc can reach, the more he can help. [2:02] Next week, Marc will share an Encore Episode where he interviews Susan Lahey, who is the co-author on the Repurpose Your Career books. He is trying to get Susan to speak to us about her move to Portugal. That’s where Susan is, as Marc records this episode. [2:26] This week, Marc will be discussing their trip back to Austin, his experiences in Austin, their return trip and the start of the Resident Visa process, first in the Consulate of Mexico in Laredo, and then back in Ajijic. Marc hopes you enjoy this episode. [2:44] Marc had a variety of reasons to return to Austin at this time. In the first week in March, Marc was speaking at the Texas Hospital Insurance Exchange, an association. The speaking gig was booked long in advance of the Millers’ move to Ajijic. Marc also needed to get the car inspected and the registration renewed. [3:28] The Millers also were still emptying their storage room, which was costing almost $80 a month. On this trip they gave a king-sized bed to a friend. [3:52] They had planned to start the visa process at the Consulate of Mexico in Austin in December but they had run out of time. So, they are stopping at the Consulate of Mexico in Laredo, on the way back to Ajijic from this trip. [4:16] On this trip, Mrs. Miller got to visit her parents while Marc did the income taxes. [4:32] The Millers left Ajijic on February 29 and drove to Matehuala the first day. It was a nice six-and-a-half-hour drive on toll roads and a few small roads. They stayed at the Las Palmas Midway Inn, where expats stay as they travel. It is an old pet-friendly motor inn. They stayed in a more renovated room that was quite nice, for $61 for the night. [5:19] They left about 7:30 a.m., expecting a seven-hour trip to Laredo. It turned into a 12-hour day. Road construction added an hour. A security checkpoint backed up traffic for miles as they looked at every truck. There are 10 trucks for every car on the road. [5:59] Next, there was a power line draped over the highway. The power company, CFE, fixed it after an hour-and-a-half. Marc is happy they were near the front of the line. [6:40] They arrived at Laredo at about 4:30 p.m. and processed through the banjercito for the temporary import permit for their car. Their $400 was refunded to their credit card (in spite of the Millers’ having changed card numbers because of a compromised card). Then it took an hour-and-a-half to cross the Laredo International Bridge Number 1. [7:31] The Millers got to the hotel in Laredo at about 7 p.m. They were pretty exhausted. It was a very, very long day with lots of sitting in traffic. It’s something you have to get used to. If not for the delays, they could have made the trip in one 12-hour drive from Ajijic to Laredo. But delays are expected. [8:04] The Millers checked into the La Quinta at the Laredo airport, which they like better than the one near the border. They had a nice dinner and the next morning headed off for Nacogdoches in East Texas. Mrs. Miller visited her parents there. Stephen F. Austin State University is the primary employer, besides the lumber industry. [8:41] Friday and Saturday, Marc hung around the hotel and did his income taxes. Being near the main road, what Marc first noticed was the massive amount of noise. Marc was no longer used to road noise and constant mechanical environmental noise. [9:57] Marc read in the Guadalajara Reporter that Mexicans don’t understand about Americans why we control the temperature year-round in our cars. That is not the practice in Mexico. [10:25] Sunday morning, the Millers headed for Austin. They stayed with an old family friend, Donna, in the neighborhood where they had lived for 28 years. She let them use an extra bedroom, where they stayed for about two weeks. [10:57] The old neighborhood was where the Millers had lived, in a house built in 1959 or 1960, until they moved to a condo near downtown in 2010. Marc noticed immediately the amount of gentrification that had occurred in the neighborhood. [11:22] The Millers walked two miles to Upper Crust Bakery and saw that 20 to 30% of the homes had been demolished and replaced with “McMansions” or were drastically added onto. In 1978, when Marc moved to Austin, it was the cheapest housing market in the country. Now, it is one of the most expensive. The change has been dramatic. [12:04] The second thing Marc noticed was everytime he wanted to do much of anything, he had to get in the car and drive. There was a Fresh Plus a mile-and-a-half away. Marc walked one day to Top Notch, a 1950s hamburger place, which was in a movie. It blew Marc away that everything is designed around the car, not around people. [12:47] He remembered that from his bicycling days. He used to lust after Downtown Portland, which was designed around people, not around cars. But this is Texas. Even the old neighborhoods, cars are necessary. [13:08] In Ajijic, in the last three months they have used the car three times. Twice, it was to get a 40-lb. package of kitty litter they didn’t want to carry on the bus. It was a mind-shift not to need the car. Austin’s public transportation is problematic. Most of the people who used it have left the area from gentrification. [14:05] 130 people move to Austin every day and the school system has lost enrollment six years in a row, primarily because people with children can no longer afford to live in Austin, so they are moving East, out of town. people visiting. SXSW is now mostly “hipster’ visitors. Locals stay away from SXSW. [15:03] Marc recently saw photos posted on Facebook of Austin downtown in 2010 and 2017 and it has changed — which is one reason why it has gotten so expensive, and one reason why it has driven the Millers out. [15:25] Marc drove up to Lakeway and gave the Multi-Generational Workplace talk that he shared on this podcast in Episode 111 and Episode 112. This event was a presentation for hospital administrators in rural counties. [15:46] That left the rest of the visit for the Millers to get their stuff done. They got the car registered and inspected and bought Mrs. Miller’s food supplements, which filled the car. They also got their bicycles serviced and ready to go — except for the pedals on Mrs. Miller’s bike, left in storage, so Marc ordered new pedals from Amazon.com.mx! [16:26] The Millers filled the rest of their time reconnecting with as many people as they could. They got rid of stuff from storage and started re-packing the car. Marc shared pictures of the packed car on Facebook. They ended up with about 13 milk carton crates filled with supplements and clothes. [17:08] They left some stuff behind to pick up in October and end their rental of their storage room. [17:21] The Millers drove back to Laredo on Sunday evening and had appointments at the Laredo Mexican Consulate Monday morning to apply for Mexican resident visas. They needed two passport pictures for each of them, filled out applications, 12 months worth of bank statements or investment statements to show adequate assets. [18:01] You must show that you’ve had over $100K in assets over the last 12 months or $2,400 a month in pension income or Social Security for a permanent visa. For a temporary visa, you must show $20K in assets or $1,200 a month in pension income. The Millers both qualified. [18:34] Mrs. Miller applied for a permanent resident visa and Marc applied for a temporary resident visa. The car is in Marc’s name, and you cannot bring a car into Mexico on a permanent resident visa. [18:56] Their appointments were for 10:00 and 10:30 a.m. Mrs. Miller got in about 9:40. Marc got in about 10:30. They were out by 11:15. They were at the Mexican Consulate a couple of blocks from the border. It was fairly easy. [19:38] The Millers have a neighbor, John, in Ajijic, who had applied through the Consulate of Mexico in Dallas. He had to return to the consulate six times. The Laredo consulate runs like clockwork. They get people in and out. It’s a very, very busy place. [20:30] However, if they had seen the supplements in the milk crates, or the cat food on the top of the car, they would have charged duty on these items. Marc had an inventory of the food supplements, so they were prepared, if asked. [20:49] The Millers next drove to the immigration office where they processed their passports. Interestingly, Marc unknowingly dropped his passport in the parking lot. He didn’t have it when he went into the office, so he ran out. A young Mexican gentleman picked it up and handed it to him. Marc wiped the sweat off his brow and thanked him. [21:23] Passport in hand, Marc went into the immigration office and processed through. Once they have processed their visas, they have 30 days to complete, so Immigration approved them for 30 days. They also got their Temporary Import Permit for the car for 30 days. They crossed the border and drove to Matehuala. [21:59] They could not get a reservation at their regular hotel. The Las Palmas Midway Inn was full! Instead, they found the Hotel Casa Real Matehuala. The reviews on Hotels.com were mediocre. They checked in around 3:00 p.m. It was not a “dump.” It was old and worn, but clean. They each had one frayed towel, no washcloths. [22:44] There were two beds and two bathrooms! It was right across the street from Walmart, so they did a little shopping there. Then they ate dinner at their favorite restaurant in town, at the Las Palmas. [23:05] Then people started streaming into their hotel. Marc says they looked to be people traveling for work, in industrial service trucks. Marc says their hotel absolutely filled to the gills by midnight. It was noisy, but clean. It was $50 for the night. [23:45] The next morning, the Millers did not rush to get out. They got to Ajijic about 3:00 p.m. It was a fairly easy drive and they ran into no problems. There’s only one short section of about 10 miles that’s not on toll roads. Each day, the Millers spent about $35 to $40 in tolls. [24:11] When the Millers got home, Marc immediately contacted their lawyer for an appointment. The lawyer told them the sooner the better. They needed 15K Pesos, or about $700. The bank was closed when they needed the money, so Marc pulled money from the credit union and from the bank through ATMs and got enough. [24:56] On Friday, the Millers went to the law office, processed and filled out all the forms, and learned they needed pictures made, both front view and side view. They did that on Saturday. The pictures had to be from a studio and they were 150 Pesos for each set. That came to 300 Pesos or about $15 for both of them to get pictures. [25:27] The attorney was able to send all the paperwork to the immigration office and had their passports back to them by 3:00 p.m. The immigration office should get back with them in about two weeks when they will go and get fingerprinted. [25:58] One of the things Marc noticed in returning to Ajijic was that he did not like living in Austin anymore. He did not like the noise. He did not like having to drive everywhere. The mass transit is not acceptable to him. He does not like the packaged food. Marc and his wife are eating all fresh food in Ajijic, and he is down to 170 pounds at 6’4″. [26:48] It was a very stark contrast, being back in Austin, and it was not the city that he remembered. [26:55] Marc hopes this gives you a good feel for the process. By the time this episode is published, the Millers should be very close to having their resident visas. Please read Marc’s fascinating blog post of March 25 on banking abroad to understand the issues of accessing your money in another country. [27:25] Marc hopes you enjoyed that episode. The Millers have spent nine of the last 12 months in Mexico. Their current plan calls for them to return to Austin by car in October. Marc will likely fly to New Jersey for a high school reunion, and possibly some audience meetups. Marc has a huge following in the NY Metropolitan area. [27:52] In 2020 the Millers will likely return to the U.S., sell the car, and either go carless or purchase a Mexican-plated car. Marc’s attitudes about money, environment, and the culture he desires have changed a lot, in the last 12 months. [28:09] Listen to Marc’s interview with Queen Michele in Episode 119 to hear her similar story of how she has been transformed from leaving the U.S. and moving to the North Shore of Lake Chapala. [28:23] Marc thanks you for listening to this episode. [28:26] The CareerPivot.com/Community website has become a valuable resource for more than 50 members in the Beta phase of this project. They have crossed the 50-member threshold! Marc will be recruiting new members for the next cohort in a few weeks. [28:41] If you are interested in the endeavor and would like to be put on the waiting list, please go to CareerPivot.com/Community. When you sign up you’ll receive information about the community as it evolves. [28:55] This is a paid membership community with group coaching and special content. More importantly, it’s a community where you can seek help. Go to CareerPivot.com/Community to learn more. [29:12] Marc invites you to connect with him on LinkedIn.com/in/mrmiller. Just include in the connection request that you heard Marc on this podcast. You can look for Career Pivot on Facebook, LinkedIn, or @CareerPivot on Twitter. [29:34] Please come back next week, when Susan Lahey, the co-author of the Repurpose Your Career books tells her story of going from a journalist to a freelance writer. This is an encore episode with an update on her move to Portugal. [29:48] Marc thanks you for listening to the Repurpose Your Career podcast. [29:52] You will find the show notes for this episode at CareerPivot.com/episode-121. [30:00] Please hop over to CareerPivot.com and subscribe to get updates on this podcast and all the other happenings at Career Pivot. You can also subscribe to the podcast on iTunes, Stitcher, the Google Podcasts app, Podbean, the Overcast app, or the Spotify app. The post The Millers Go Back to Austin and Start the Resident Visa Process [Podcast] appeared first on Career Pivot. This is the third in the series on ageism. The 1st post was Ageism – What It Is, How to Identify It and What to Do About It, the 2nd was How To Identify Ageism In The Workplace – Ageism Series Part II, and in this post, I want to identify what to do about it. Ageism is like sexism, racism, or any other kind of discrimination that is ingrained into our society. We cannot change other’s beliefs, but what we can do, is change our own behaviors to influence both our peers and the younger generations. Change must start with you and me. Have you said to someone — I just had a senior moment. Using language that makes fun, or is dismissive about being old, promotes ageism. I was offended when I heard that, so why should we want to make blanket statements about those that are much younger than us. I admit that I am ageist. I have commonly told people that I suffer from CRS disease. (CRS – Can’t Remember … Stuff). When I make statements like that, I am being ageist. I have been working on changing my own behavior as it relates to my own generation. As far as the younger generations, I have used non-ageist language ever since I started giving my multi-generational workplace workshop. This forced me to change my language and my own behaviors to my younger comrades. Are you ready to change your behaviors? The world is changing at an accelerating pace. Creative destruction is affecting industries and professions that you cannot stop growing and learning. Unfortunately, many of our generations left the responsibility for learning to our employers. Since the great recession, employers have stopped developing their employees. It is cheaper to hire for the skills you need than train their existing employees. However, it has never been easier or cheaper to stay up to date in most skillets. Online courses have proliferated and are very affordable. It is your responsibility to stay up to date. Plan on attending one industry event each year, even if you have to pay for it. Stay up to date with online courses. It is the 3rd suggestion that I find many of my generation going, what is a podcast? Podcasts are free, can be listened to on just about any device, and the topics are nearly infinite. Heck, there is a Chameleon Breeders podcast. There is a podcast for just about anyone to stay up to date on just about any topic. This idea came from Sharlyn Lauby post 3 Ways You May Contribute to Your Own Ageism on the Unretirement Project blog. One of the key points that I make in my multi-generational workplace workshop, is if I want you to listen to me, I have to adapt to you. This is a 2-way street where we all have to adapt to one another. I am a baby boomer and I like people to talk to me. My son is an old Gen Y or millennial, and I mostly communicate with him via text. My son though knows that his mom would prefer for him to call her and he usually does do that. Many of us have adapted our communications styles with our adult children, but have you done that at work? What if you had no children? Do you have a good idea of how to communicate with a younger generation that has been connected electronically for at least the last 15 years? If not, you should get some practice. In preparing these series of posts, I gave a presentation to Launch Pad Job Club on Ageism. We discussed how to interact with the younger generations. One gentleman came up to me afterward and told me he volunteered for the Beto O’Rourke for Senate campaign. He said that it was a great experience working with talented, young and passionate volunteers who he was old enough to be their father. His perspective and opinion of the millennial generation had changed dramatically, plus he learned to adapt his communication style to seamlessly fit in with the team of volunteers. Do you work, socialize and hang out only with people like yourself? If you do, you are likely going to be ageist because you will form opinions based on 2nd hand information. If I want to eliminate ageism, I know it starts with my own behaviors and actions. This is no different than racism or sexism, as we work to eliminate both from our society. It all starts with ourselves. How has ageism affected you in the workplace or society? In what ways have you been ageist? Yes, most of us have behaved in an ageist manner. Take a moment and comment below. The post Ageism and What to Do About It – Part III appeared first on Career Pivot. John spent about 35 years in the entertainment business, starting out in the 1970s as a literary agent and then a producer and studio production executive for companies like MGM, Orion Pictures, De Laurentiis Entertainment, Warner Brothers, Columbia Pictures (now Sony), and a few others. He produced films for about 15 years before hearing the siren song of technology in the early 90s, when multimedia was springing up. John produced a handful of CD-ROM games, which were new and fun at the time. John went into business with a partner who had an idea for a new technology marrying artificial intelligence with behavioral animation to create interactive, conversational online animated characters. The conversations would occur by text through the keyboard. They had the system working over dial-up internet and got a huge deal with Sprint for a customer service character for their website. That was in 2001, as the tech startup bubble burst. John’s company fell into the hole, along with everybody else. Their Sprint deal went South and their investors pulled out. His partner told him, “I guess the future’s gone out of style.” At midlife, John was at a crossroads. Listen in to this fascinating episode to hear how John aligned with his future by reinventing himself as an educator and trainer. [1:17] Marc welcomes you to Episode 120 of the Repurpose Your Career podcast. Career Pivot brings this podcast to you. CareerPivot.com is one of the very few websites dedicated to those of us in the second half of life and our careers. Take a moment to check out the blog and the other resources delivered to you, free of charge. [1:48] If you are enjoying this podcast, please share it with other like-minded souls. Subscribe on CareerPivot.com, iTunes, or any of the other apps that supply podcasts. Share it on social media or just tell your neighbors, and colleagues. The more people Marc can reach, the more he can help. [2:08] Next week, Marc will be discussing the Millers’ next steps in becoming expats in Mexico, regarding banking and their initiation to the resident visa process in Mexico. [2:21] This week, Marc interviews John Tarnoff, author of Boomer Reinvention: How to Create Your Dream Career Over 50. Marc interviewed John in Episode 19 but wanted to do an update with him. [2:33] John introduces himself to the listeners, at Marc’s invitation. [6:11] After the tech bubble burst and John’s company failed, he was 49 years old, had no idea what he was going to do next, and was not interested in going back to the same Hollywood jobs where he had started. [6:30] John didn’t think anyone was going to hire him into those same jobs. So, he “bet the farm” on a reinvention. He remortgaged his house for the last time to build himself enough runway to figure out his future. [6:49] John went back to school to earn a counseling psychology degree because he wanted to learn more about himself, what made him tick, and how to interact better with others. He supposed that in the process he would figure out something to do. [8:00] John did not foresee that nine months later he would be working for Dreamworks Animation at two-and-a-half times his former executive salary, doing work that was really aligned with where he wanted to go. [8:48] Dreamworks was transitioning from a traditional animation studio to a computer-generated animation studio. John knew the CEO, Jeffrey Katzenberg, from his Hollywood years. He was clearly a visionary. He had put the company together with Steven Spielberg and David Geffen after being fired from Disney in 1994. [9:30] Dreamworks had become very successful with Shrek. People John knew there encouraged him to join them. There were no open jobs, so he started networking. That taught him that when you come into a group of people, bringing your most heartfelt, authentic, inquisitive, and service-oriented “game,” you start getting into conversations. [10:15] If the alignment is there between yourself and their thoughts and needs, then there is the beginning of an opportunity. That’s what happened for John. [10:33] This was a company that was very innovative, at the intersection of creativity and technology, and it was in line with the work John had been doing in his startup. They saw that and in June of 2003, John was in Jeffrey’s office making a deal to work there. It was his best Hollywood job. He stayed through 2009. [11:14] That job completely set John up for the work he is doing today. [11:18] When John had worked earlier in Hollywood, he had looked forward to a time when he could educate and help people. He is an “organization freak” and he likes to see how things get laid out, and how people’s minds work. Whenever he had an opportunity to tell a class of students about the work he was doing, he jumped to do it. [12:05] That defined his role at Dreamworks. When he interviewed, he wanted to know what they were doing about future generations, for training and development. They hadn’t given that much thought. It was not a core driver for them. [12:29] After John had been at Dreamworks for about a year, they began to realize that their human capital needed some “recharge” and that they had to expand their thinking about where they were getting their talent. Their talent was not coming from the traditional sources. [12:48] Many of the specialists and department heads determined they needed to “grow their own.” They turned to John and, based on his interest in education, asked him to build a program. That’s what he did, with a school outreach program and an internal virtual university. [13:16] This changed his role from a production troubleshooter to being totally embedded in the outreach program. They started with seven schools in 2004. By the end of 2009, they had over 40 schools in the network. It was quite a culture change. [13:51] In the wake of the recession, Dreamworks was seeing the need to batten down the hatches, and they started focusing on monetizing their existing IP and pulling back from their school outreach. John parted ways with Dreamworks. It was amicable and they kept inviting him to their parties! To this day, he and Jeffrey are on good terms. [14:58] The Dreamworks job was a phenomenally positive experience, and it helped John make this transition full-time into education and training. The following year, John started a position at Carnegie Mellon University. John says, timing is everything, but you have to set yourself up to be a target when the timing is right. [15:28] In 2010, Carnegie Mellon had set up a very innovative program in Los Angeles with cross-disciplinary initiatives for kind of an MBA for how the entertainment business works. Entertainment is a very unique business. The program is for people on the business side of film, TV, video games, and music. [16:33] They were looking for someone to round out their Los Angeles management team. They wanted someone with industry background who could balance the more academically-oriented full-time program director. John partnered with that person and they grew the program quite successfully over the last nine years. [17:11] It has been a great anchor position for John while he has gone on to do “a bunch of other stuff” in a portfolio career. [17:32] John considers a portfolio career to be very relevant to people in their late career stages, in their 50s and older, who are trying to figure out how they will keep working and what they are going to do. It’s not going to look like the first 20 or 30 years of their career. [18:01] John is 67. He will keep working as long as he wants to and as long as he needs to. Most Boomers are skating a very interesting line between longevity and bank account. When the retirement pension system was first set up in the 1860s it was set at 65 as an age by which most factory workers were either dead or not many years from it. [19:11] As longevity has grown over the last 100 years, pensions have grown increasingly difficult for corporations. All guaranteed defined benefit programs are affected by extended lifespans of the participants. We are in a real retirement crisis. [19:44] If you are 65 today, you have at least a 25% chance of living to 90. Every year you live longer than 65 increases your chances of living to 90 or beyond. The average retirement age is 62. If you live until 90, one-third of your life will be spent “in retirement.” Must of us don’t want to spend 30 years queuing up for sundown specials. [20:33] The Boomer Generation wants to stay more engaged. That doesn’t mean working nine to five. We are going to continue to stay engaged in the work that we love to do. What we want to do might be different from what we did in our 30s and 40s. [20:56] We are going to need to keep earning money because the average retirement account if you have one, is about $100K. That’s not going to last you 20 or 30 years. A lot of people are downsizing intelligently and looking at ways to stretch their dollars. [21:43] We need to think about ways to supplement the income we already have from Social Security and our savings because there are going to be unpredictable things that happen. Healthcare is a big item, as well as family issues and logistical questions. We have to be better prepared, financially, for this extended period of life and engagement. [22:14] John’s portfolio after Dreamworks includes his consulting work at the intersection of education, technology, and entertainment. For the first few years, he was consulting with industry companies, trade associations, and schools around the future of talent search, curriculum, and skills. [22:59] In 2012, John was asked to present a TEDx talk and the topic was Transformation. As he had been reading up on all the issues the Boomer Generation had had, coming out of the recession, around retirement, savings, and getting jobs, he asked, if we’re living longer and nobody wants to hire us, what are we going to do? [23:53] John realized, we’re going to have to take responsibility, somehow, for this. If we do, then what does that look like? That’s when he came up with the idea of five career reinvention steps. That became his TEDx talk. After that, people kept asking John what he was going to do with that — does he coach? John said, sure, of course, he coaches! [24:24] So John started working with people around some of these questions and to implement the five steps to reinvention. [24:37] The five steps are: 1) Reframe your idea about who you are and what you can do, 2) Listen and understand how the world has changed, 3) Reconcile the past; don’t bring your sad baggage into meetings, 4) Express these new ideas about what you could do, and 5) Network. Understand who can do what, and what you can do for them. [26:16] Most importantly, you’ve got to always be giving in your networking activities. Build the relationships necessary to put you in front of the people who can benefit from what you have to offer. You don’t build a network by sending out resumes, because no one is going to read them. [26:37] Marc says one of the key pieces is that you are never going to do this alone. Marc’s own business coach taught him to understand the things that he needs to leave behind. A lot of things you’ve done in your career, you don’t want to do anymore, regardless of how good you were at it. [27:21] John sees a lot of clients that have difficulty giving up the social cohort they’ve gathered after working 20 years with the same people and then being let go from the job. People find it hard to let go of that job. Even if they were downsized, they want to go back. It’s very important to be able to reconcile the past to envision your future. [28:30] Marc had encouraged John to finish his book. So John has a book, he’s coaching, and he works at Carnegie Mellon. What else does John want to be doing in five years? [28:50] John wants to continue on his current path. His coaching has evolved from one-on-one to small groups, to larger groups, and now, with UCLA Anderson School of Management, coaching groups of 20 alumni online, on Zoom, who are going through career transitions. John is coaching them as a group with his five-step process. [29:33] Some of them are returning to work after an absence. Some have been let go. Some are contemplating making a move. There are all sorts of interesting permutations along the idea of transitions. [29:49] John seems to be following an arc of reaching more and more people with this methodology. This year, he is working on putting this all into an online course, which will go through five steps, 23 strategies, and six key skills, and give people the opportunity to pursue a self-guided course with some group mastermind interaction with John. [30:41] Marc talks about his group membership site and makes some observations about the cost of one-on-one coaching. The people he really wanted to work with couldn’t afford it. The group model allows for greater flexibility. Marc can do it from Mexico. [31:19] One of the common themes of folks in Marc’s online community is that everybody wants freedom. They want to work when they want to work, how hard they want to work and choose what they want to work on. Their ideas about that have changed over their careers. [31:51] John says Boomers are becoming more like the Millennials. Marc says to listen to your feelings and see what you are telling yourself about what you want to do. Most of us acted in roles and got paid to play those roles. If we did them long enough, we started believing we were those roles. [32:29] When Marc hit his 50s, it became exhausting for him to stay in character. [32:42] John will probably still be in California in five years. He has an urban homestead with his love. They have a coop with 20 chickens, vegetables, and a great spot of land under the mountains. It’s a gorgeous day, there. He doesn’t see moving before his early 70s. [33:43] John hopes to continue working with Carnegie Mellon. It’s a great time for kids to be entering the entertainment industry. He likes to work with Boomers, too. He says it’s a great opportunity to be working on both ends of the career spectrum, young people starting their career and older people taking what may be their final career steps. [35:17] Your work between your 50s and your 70s will probably not be a full-time job, and it will probably be a collection of things or a portfolio. That’s the key piece. Marc has several members of the online community who have their heads wrapped around the fact that they’re not doing just one thing. [35:45] They may work harder than they used to, doing stuff they enjoy. They are not necessarily working for a single employer on a set schedule. [36:08] John suggests for listeners first to read his book, Boomer Reinvention: How to Create Your Dream Career Over 50. That will give them a clear idea of whether they are aligned with John’s thinking. [36:40] You can reach John through his website, JohnTarnoff.com, follow him on Twitter @JohnTarnoff, or on Facebook, @JohnTarnoffCoach. He loves interacting with people and helping them get in the right direction. [37:30] Marc thanks John for being on the Repurpose Your Career podcast. [37:40] Marc hopes you enjoyed this episode. As it turned out, they never were able to meet in Austin when Marc and John were both there. Austin was hectic and congested with 50K visitors to SXSW Interactive Week. [38:09] The CareerPivot.com/Community website has become a valuable resource for more than 50 members in the Beta phase of this project. They have crossed the 50-member threshold! Marc will be recruiting new members for the next cohort in a few weeks. [38:24] If you are interested in the endeavor and would like to be put on the waiting list, please go to CareerPivot.com/Community. When you sign up you’ll receive information about the community as it evolves. [38:37] Those in the initial cohorts will get to set the direction for this endeavor. This is a paid membership community with group coaching and special content. More importantly, it’s a community where you can seek help. Go to CareerPivot.com/Community to learn more. [39:01] Marc invites you to connect with him on LinkedIn.com/in/mrmiller. Just include in the connection request that you heard Marc on this podcast. You can look for Career Pivot on Facebook, LinkedIn, or @CareerPivot on Twitter. [39:20] Please come back next week, when Marc will discuss the Millers’ next steps in becoming expats. [39:25] Marc is recording today’s intro and outro segments in Matehuala, Mexico, on their way back. The next day they will be driving into Ajijic after a three-week trip to Austin and back. [39:47] Marc thanks you for listening to the Repurpose Your Career podcast. [39:50] You will find the show notes for this episode at CareerPivot.com/episode-120. [39:57] Please hop over to CareerPivot.com and subscribe to get updates on this podcast and all the other happenings at Career Pivot. You can also subscribe to the podcast on iTunes, Stitcher, the Google Podcasts app, Podbean, the Overcast app, or the Spotify app. The post Boomer Reinvention Revisited, with John Tarnoff [Podcast] appeared first on Career Pivot. Now that we have permanently moved to Mexico, banking has become a necessity of life. We need money to live on, and up until now, all of the money resides in institutions in the U.S. I have been chronicling our experiences in this blog and on the Repurpose Your Career podcast. I have been discussing our experiences on the podcast and writing about the business side of the move here on the blog. You can find all of the blog posts and podcast episodes where I am chronicling our journey and the decision-making process on the How to Move Abroad and Take Your Job With You Series Page. Use a local ATM to withdraw money from your U.S. bank. Open a Mexican bank account and wire transfer money from your US bank to your Mexican bank. Withdraw money from the bank via a teller (yes, they still exist). Access your money via an ATM. Before you leave the US you should tell your credit card providers and the bank that you will be in Mexico. Most will put a comment in your credit file which is only good for 3 months. When you access an ATM the first time, find one that will let you choose the language. If you are in smaller markets, they will only present the menu options in Spanish. The first time I went to withdraw money it asked in Spanish how much I wanted to withdraw using the symbol “$” which I assumed meant in US dollars. I entered 100 and I receive 100 Mexican pesos or the equivalent of 20 US dollars, not the amount of Mexican pesos that was equivalent of 100 US dollars. DUH! In Mexico, the symbol “$” represents Mexican pesos. My first lesson in Mexican banking. If you have to use a machine with Spanish only menus, use Google Translate. Use the camera option to translate the ATM menu. When you withdraw from an ATM, you have immediate access to your money, but the amount of money you can withdraw is limited by the bank that owns the ATM and your bank in the US. The transfer time is immediate. ATM fees vary a lot from bank to bank, and then there are the fees your bank charges. These fees are on a per transaction basis, therefore, the more money you withdraw at a time the less expensive the fees are. For example, there is one bank that allows me to withdraw a maximum of 7000 Mexican pesos at a time and charges just over 80 pesos in fees. Another bank allows me to withdraw a maximum of 5000 Mexican pesos at a time and charges just over 30 pesos in fees. You would think the 2nd bank would be a better deal but it is not because the exchange rate I get from the 1st bank is so much better. My credit union charges me $1.50 (US) to withdraw from an ATM that is not part of their network. I may be paying $5-7 (US) every time I use an ATM in Mexico to access banking in the US. The exception to this is Charles Schwab money market accounts, which allow for unlimited withdraws from international ATM’s and they refund all transaction fees. This is very popular but there is one caveat, you cannot have permanently left the US. Most people get around this by maintaining a US mailing address, which we have done. You can establish a bank account in Mexico but it usually requires you have some form of resident visa, either temporary or permanent. Notice I said usually because we were able to establish a bank account with just a tourist visa. This took some digging through several Facebook groups and then discussions with several well-established expats that know the ropes. My recommendation is you explore your options by speaking with established expats in the area where you plan to move. Once you have a bank account, you can wire transfer from your US bank to your Mexican bank when exchange rates are favorable. I will give you 3 examples on how you can wire transfer money but the speed, fees, and exchange rates will vary and sometimes a lot. When I established my bank account, I was not automatically given access to online banking, I had to ask for it. I was issued a token device. See image to the right. When I go to log in on the bank’s Internet banking webpage or on the mobile app, I am presented with an 8 digit code which I enter into the device and it returns an 8 digit code that I must enter into the web page or mobile app. This makes this cumbersome but very secure. I do not carry this device around, so using the mobile app when I am away from home is impossible. I do not know if all of the Mexican banks operate in this fashion. The first option is to do a wire transfer from your US bank to your Mexican bank. When I did this, I received instructions from my Mexican banker which I forwarded to my US bank. I was charged a US $30 fee and it took about 24 hours for the money to show up in my Mexican account. The exchange rate was good but not great and was determined by my Mexican bank. The second option is to use a PayPal owned service, Xoom. They offer transfers of money for a flat fee of US $4.99 and it typically takes 3 days. They cannot transfer money to just any bank and they do not support the bank I am using. In addition, the exchange is much lower and therefore, I have not used this service. The third option is to use Transferwise. They charge a flat fee of US $4.99 plus an ACH fee that is in proportion to the size of the wire transfer. The exchange rates are superior to the first two options. The downside is it takes about a week to receive the funds. The exchange rate is superior to anything else I have seen and makes up for the higher fees. We have opened up a bank account at Intercam Banco and now have a Visa debit card. I am limited to withdrawing 5000 Mexican pesos per day from an ATM and the maximum online purchase, I think, is 1500 Mexican pesos. I say ‘I think’ because I have not tried this yet and I do not remember what I was told about the limit. I will be using Transferwise to move money from my US banks to Intercam Banco. We currently have debit cards with 3 different banking institutions in the US. Why have 3 you may ask? If you lose a debit card and need to replace it, it can take a significant amount of time. You can cancel it quickly but getting a new card is an issue. Since most business establishments where we live do not take credit cards, it is a cash-based society. You must have back-up plans. Fortunately, having a local bank account is a big advantage. I will be exploring getting a Charles Schwab account as another way to reduce ATM fees. I pay my rent in cash each month and I was withdrawing the monies from my US banks over multiple days from the ATM machines. What a pain. Now I will be able to go to the bank and receive the funds from a bank teller and then walk over and pay my rent. The bank is only 2 blocks from our casita and the rental office is 4 blocks in the opposite direction. We have multiple credit cards with US banks that we will continue to use to make purchases in the US. For example, I pay for my storage unit in Austin on one credit card, and my wife pays for nutritional supplements on another that is shipped to a friends house. We will make another run to Austin in October and bring back what has been stored. In no way have I figured all of this out yet … but I am getting there. The post How to Move Abroad and Take Your Job With You – Banking appeared first on Career Pivot.